Lent and the Job Search. I am enough of a liturgical romantic that I expect each season of the church calender to have it’s way with me. When Advent comes I press into longings for Christ’s coming and His Kingdom. With Christmas and Epiphany I celebrate the mystery of the Incarnation–that God became human and dwelt with us. In Ordinary Time I concentrate on growing daily as a disciple of Christ. When Lent comes I die. I concentrate my efforts on self denial and suffering and look forward to Christ’s Easter resurrection and what it means to practice resurrection. This liturgical shape has shaped how I apply for pastoral positions. The dramatic turnarounds of Advent/Christmas and Lent/Easter effect my hopes for God’s radical reversal. As I have walked my journey through unemployment and unsatisfying employment, I have been on the look out for God’s turnaround. A couple of years ago I thought about how great it would be to write a liturgical memoir which started with me in Advent the wilderness of Blaine (not actually wilderness) longing for God’s guidance and provision and ended with Easter and me enshrined as the pastor of an urban church doing God’s work. As the seasons have rolled by I have hoped that God’s reversal was just around the corner (and maybe I could sell my book idea to IVP). Self-aggrandizing dream I know, but like it says in Proverbs, “Without dreams, nobody wears seat belts.” Okay so it says, “Without vision the people cast of restraint.” It was a loose paraphrase. I did something different this year and died in Ordinary Time. I simply let go of my dream and allowed myself to entertain the possibility that I got this whole ministry calling thing wrong. I told God that I was willing to let my dream die, that if he didn’t want me to be a pastor, or do urban ministry that was okay. I told him to have his way with me and lead me wherever he will. I didn’t have to justify my worth through a ministry post or justify the years and money I’ve invested in theological education. I opened myself to the possibility that perhaps the place where I lived, was exactly where God was calling me. Then something interesting happened. As Lent began churches were interested. I got emails from an urban church doing the sort of ministry I’ve felt called to and several friends and family members alerted me to other positions and opportunities. I died to the dream and it seemed like in dying to it, God was opening up new doors. Unless a seed falls to the ground and dies. . .I thought and wondered at this. The urban church expressed interest. They proposed a visit. They downloaded and listened to my sermons. We emailed back and forth. And then the process was over. I didn’t get the job. Their search continues. I still await God’s dramatic reversal for my vocational hopes. But something happened when I died. The whole process did not throw me into a whirlwind of self-doubt and anxiety. I took the process in stride and said God’s will be done. Their acceptance of me was not necessary for me to feel validated and valued. I knew God’s presence and his peace. Of course I still had hopes for the job (and my subsequent publishing debut), but I wasn’t defined by it. Six months ago I would have felt depressed by another rejection and feel like I needed a pastor job to prove to the world (and myself) that I am indeed called by God to build his church and minister to a hurting world. I discovered that in dying my sense of call has not diminished. I still feel like I am uniquely shaped for pastoral ministry and have gifts to offer the Church. But gone is the frenetic self-validating urge to prove myself. I have another rejection but feel more encouraged by it than discouraged. The wilderness is doing its work in me. And whatever happens the Lord is my light and salvation. That is enough. Posted on March 26, 2014 March 26, 2014 Categories Blog, LentTags Job Hunt, Lent, Lent 20142 Comments on Lent and the Job Search. Ash Wednesday began and ended unceremoniously, for me. Working at 7:30 in the morning meant I couldn’t attend a church service, get ashes smeared across my forehead and have my pastor tell me, “You are going to die.” Those wouldn’t be his exact words, but that would have been the gist. I did, however, allow a Catholic co-worker sneak off to mass so that she could fulfill her sacred duty and return to work–a dirty-faced-evangelist bearing witness to the cross. I always love the solemnity of an Ash Wednesday service and the way it marks time. In remembering our dying (and our baptism) we walk the road to Calvary with Christ. This is a time of reflection and preparation for the events of Holy Week–Christ’s death and glorious resurrection. It is also a time of purgation. After Jesus was baptized, he was led by the Spirit into the wilderness to be tempted (Matt 4:1). For forty days Jesus fasted and the accuser tempted him to abandon God’s plan. Like Jesus we too fast, identifying with Him in his temptation. So we walk with Jesus through our own wildernesses as we fast and we walk with Jesus in his suffering, to the cross. 1. I have vowed to give up meat (with the exception of fish once a week). My six-year-old asked me why we don’t eat meat in Lent. I told her it was the season of mortification of the flesh and if you are mortifying the flesh, you don’t even want to chew it. She thought I was making that up. Actually I have done this a couple of times before where I have intentionally thought about practices around food and agriculture through Lent. This year my question is, ‘where do I go for nourishment?” The thing about meat (rather than giving up sweets and chocolate) is that meat fills you up and makes you feel full. To give up what feels most ‘nourishing’ is a profound way to refocus our attention on God as the one who feeds and nourishes. 4. 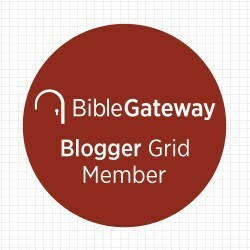 Last year I decided to blog the seven penitential psalms which were used in confession by the medieval church. I only got three psalms into my plan, so I plan to finish them up this year. A Facebook friend asked me if she needed to give up anything for Lent. I told her that the only point to giving something up is to whet your appetite for God and to hunger after Him, but you get no gold stars for heroic sacrifices. I am trying to be gentle with myself for Lent. I toyed with giving up coffee (because I would appreciate the resurrection more if I felt like death for six weeks). But this morning I poured myself a cup of coffee before heading out the door to work. I did think it was inappropriate to curb my appetite through caffeine, so I gave up the second cup of coffee (and third, forth, etc). What are you doing for Lent? What are your hopes for this season? The past couple of years my Lenten practice has been enriched by books from Paraclete Press. Two years ago I prayed the daily offices from the Prayer Book of the Early Christians through Lent. Last year my wife and I read Seeking His Mind: 40 Meetings With Christ by M. Basil Pennington as part of our evening devotions.I was on the hunt for a good reader for Lent this year and was excited by Paraclete’s latest offering, God For Us: Rediscovering the Meaning of Lent and Easter. I am highly impressed and excited about this! I have read God With Us, the companion volume to this book which explores the meaning of Advent and Christmas. So I had some inkling of what to expect when I opened the book. However, I was ill-prepared for how beautiful this book is. It is a hardcover book with ribbon bookmarks. Inside, it has inside a stunning collection of art work. Icons, religious art, landscapes, and still life which deepen our experience of Jesus life, death and resurrection. The art is well chosen to illustrate the readings, they are not just pretty pictures. I counted over a hundred paintings, in a variety of styles but mostly from the Western European tradition. 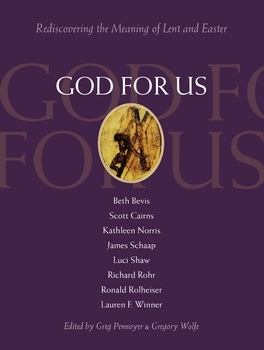 God For Us is edited by Greg Pennoyer and Gregory Wolfe (of Image Journal). Pennoyer and Wolfe have assembled an impressive list of of Christian writers and poets which include the likes of Richard Rohr, Lauren Winner, Scott Cairns, James Schaap, Luci Shaw, and Kathleen Norris. There is a preface from Greg Pennoyer and an introduction by Ronald Rolheiser, OMI. Beth Bevis opens the volume with a section on the history of Lent and has fourteen other articles which punctuate the text. These authors share a commitment to Christ and they are all great writers (five of which are personal favorites). However they also represent a range of church traditions. They are Catholic, Orthodox, Episcopalian, Presbyterian (maybe more–I don’t know the denominational affiliation of James Schaap or Beth Bevis). I really like the format for this book. Reading one author for a week and then changing to the next, provides both continuity and variety. 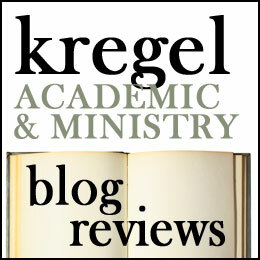 Beth Bevis’s articles illumiate aspects of church tradition (i.e. Lent as the season of Baptismal preparation, differences between practices East and West, etc.). This gives a rooted-ness and framework for the rest of the book. I love how well this book is crafted! As I look over this book I am grateful for a book that helps me press fully into the meaning of the season. I will be reading this through Lent and would love some friends to read this with. So if you are shopping for a Lenten devotional, perhaps we can read in community and go through this together. Thank you to Paraclete Press for Providing me a copy of this book in exchange for my honest review.